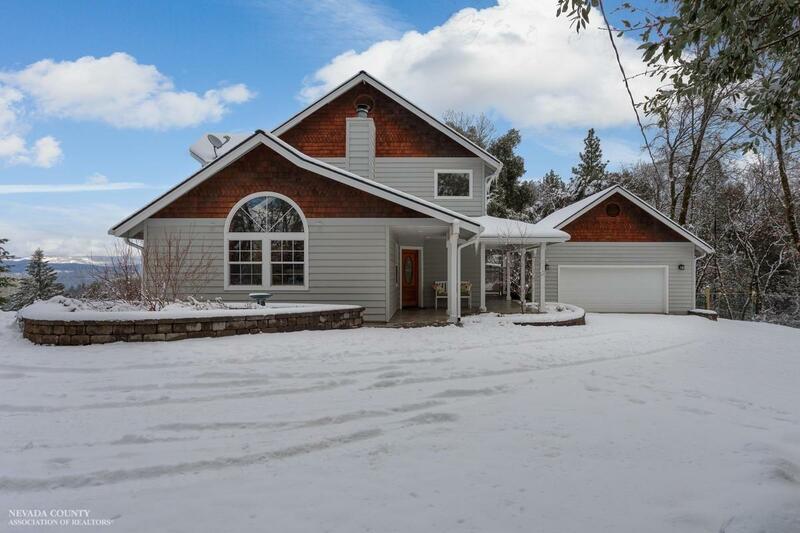 Own your own mountain top sanctuary with 5.7 acres of tranquility with views of the Sierra Buttes & Malakoff Diggins, set up for horses with access to endless riding trails. If you are looking for solitude and privacy look no further, beautiful oak setting with good sun exposure. Lovely home with great kitchen lay- out, open floor plan, bedrooms are spacious with each having their own bathroom. There is one bedroom on lower level that is currently being used as home office with good internet connectivity. Whole house generator with automatic turn on, the well has separate pull start generator. Other features are solar, 3 year old roof with Byer's leaf guard gutters, round pen, paddock, loafing shed, water storage tank, new wood stove, fenced dog yard, & water conditioning unit. There is also 4 acres across the road facing south, which is included in this parcel. Come see this special home and property, only 13 minutes to Hwy 49 and Nevada City.